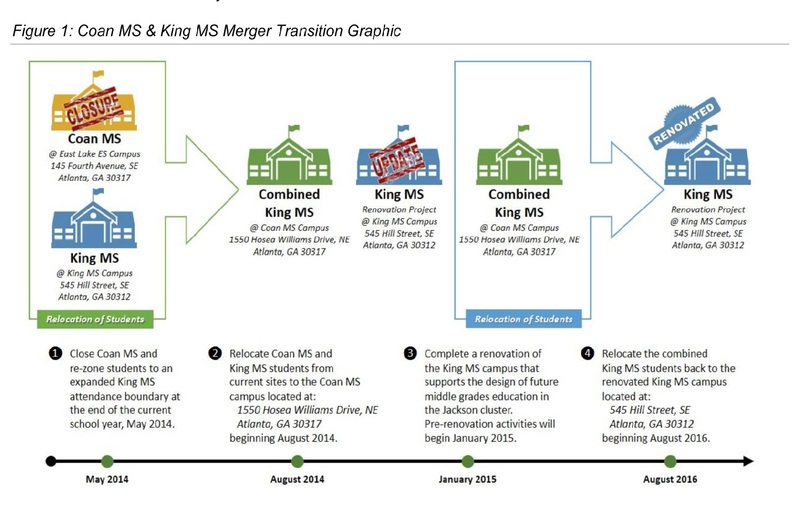 On June 2, 2014, the Atlanta Board of Education approved the superintendent’s final recommendation to close Sammye E. Coan Middle School and merge it with Martin Luther King Jr. Middle School. When school begins August 4, 2014, students of the merged school will officially report to the original Coan campus for two years while King undergoes renovation. The decision to merge and close schools is never easy. However, the merged schools will result in improved middle school experiences and a quality education for all students in the Maynard Jackson High School Cluster. The Jackson Cluster has two feeder middle schools. Both schools are underutilized in a school system where staff and other critical resources are tied to student enrollment. Sammye E. Coan Middle School has a current population of approximately 260 students. The Coan facility is designed to hold 1,025 students. There are 440 students living in the Coan zone, and approximately 50 percent of the in‐zone students attend Coan. Within the next five years, Coan attendance is not estimated to exceed 300 students. Martin Luther King Jr. Middle School has a population of an estimated 460 students in a building that is designed to hold 1,000 students. Of the 715 students living in the King zone, nearly 60 percent of the students attend King. Combining both schools will result in a campus that will have a larger enrollment and therefore be allotted additional staffing. At a merged school, students will benefit from a variety of opportunities that cannot otherwise be offered at an underutilized school. For example, students will be able to participate in foreign language studies, sports, clubs, band, chorus and orchestra – all experiences that help create an engaging and meaningful learning program for young learners. To help ensure a smooth transition for students and parents, a diverse group of advocates, educators and other professionals has been convened. The group is part of a comprehensive transition team that will work throughout and beyond the summer to guide all aspects of the school merger. Please take some time to review the information on this website and check back often for updates about the transition team’s work.